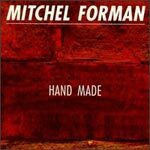 Mitchel Forman is one of the better known and most respected practitioners of the electric post-fusion jazz popular in Europe. The style combines rock rhythms and jazz-flavored improvisation for a bright, uptempo sound. The keyboardist's latest outing is a nice mixture of hard-driving songs and slower ballads. the musicianship is top-notch; the songs pleasant.